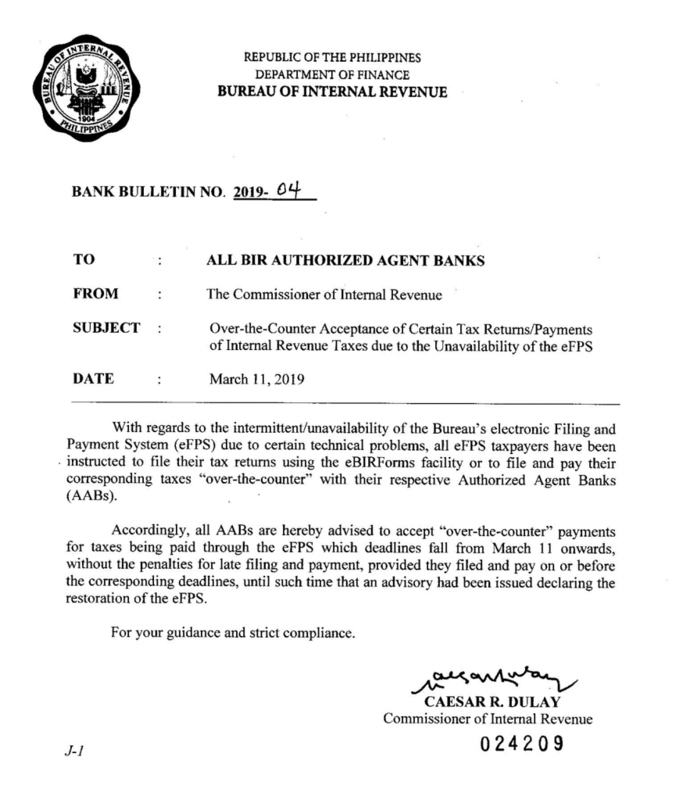 Last March 11, the Bureau of Internal Revenue (BIR) released a memo to all BIR Authorized Agent Banks. The memo states that for all eFPS filers, eBIR filing and over-the-counter (OTC) payments have been temporarily allowed by the BIR. The BIR gave a temporary solution for eFPS filers to use eBIR forms for filing the tax returns and OTC payments to its Authorized Agent Banks (AABs). Note, however, that the AABs will only accept eFPS OTC payments with tax return deadlines from March 11, 2019, onwards. According to the BIR, eFPS has been “intermittent and unavailable” for the past couple of weeks. This is a huge inconvenience given the fact that there is less than a month left until the April 15 tax deadline. The BIR is aware of that so they wanted to give other solutions for its eFPS filers in terms of filing and payment. Hence, this March 11th memo. Who are covered by eFPS? Remember to file your taxes and pay for them a couple of weeks or so before the tax deadline. This way you won’t have to spend long stretches of time enduring the long queues at the bank. What is the difference between eFPS and eBIR? 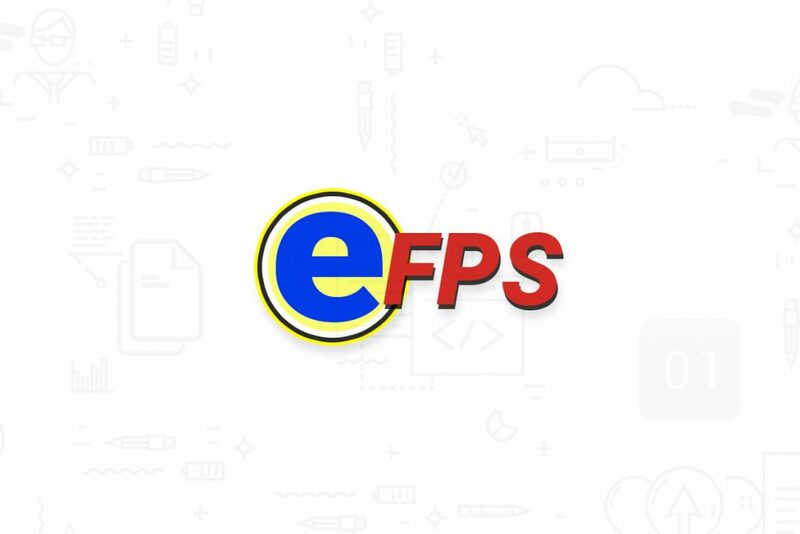 Generally speaking, eFPS is the online filing version and eBIR is what they call off-line, or desktop version of the tax software. The options for an eFPS filer to pay for their taxes used to be directly deducted from the bank, thus having seamless process from filing to payment. Now, an eFPS filer has to pay their dues over the counter. eBIR filers, usually pays over the counter although certain banks like LandBank and DBP gives online payment options for taxpayers. There is an easier option for people needing to file their taxes by April 15th and that is JuanTax. Instead of downloading eBIR, Alphalist or RELIEF software, you can consolidate all of these into one with JuanTax. On that note, to further help you with your tax-filing needs, we at JuanTax are giving you the chance to use our software for free until April 15, 2019! Do grab this chance so you may file your taxes quickly and easily. Wondering about what JuanTax can do for you? Well, JuanTax can automatically compute and seamlessly file your taxes using eBIR forms, Alphalist, and RELIEF. Nowadays, everything can be done in a timely manner and within the comforts of our own home. Why shouldn’t the same be said for our tax needs? JuanTax is not complicated nor difficult to navigate no matter how familiar you are with tax filing software. All you need to do can be summarized in three steps: 1) Upload Your Information, 2) Generate the Needed Reports, and 3) File. First, you begin by uploading the needed information. The information needed from you is your home address, your Tax Identification Number (TIN), and your contacts. Afterward, you can begin creating the report for your desired tax returns. Don’t forget to select the month and year of the return. Finally, you can file your taxes. There are two options that JuanTax gives you: Manual Filing and eBIR Filing. Simply choose your preferred option and you’re good to go. For more information on how to file your taxes with JuanTax, simply read this article to know more. Nowadays, taxpayers are open to a plethora of options that can effectively address their tax filing needs for them. To save time and to avoid hassle and heartache, let JuanTax do the work for you. JuanTax makes tax filing seamless and easily accessible. Automate your tax filing now and avoid the struggles that come with following the procedures for tax compliance. Don’t forget that JuanTax will be free to use until April 15, 2019, so don’t wait and have your #TaxDoneRight!